When it comes to upgrading your scoreboard, it can seem like your only option is to install a newer version of the same metal-box scoreboard you’re replacing. But for Prescott High School in northern Arizona, another metal-box scoreboard just wasn’t going to cut it. Prescott High School is one of the oldest schools in Arizona, older than the state itself, but their commitment to technology, innovation, and excellent student outcomes is evident. Prescott High School’s student-athletes are among the most academically advanced in the state of Arizona, and their athletics program offers students the opportunity to compete in traditional sports like basketball, volleyball, football, and soccer, or get involved with non-traditional sports like badminton and mountain biking. Prescott Athletics have a long history of being competitive at the state level, so when it came time to upgrade their existing scoreboards, their new technology needed to be as amazing as their athletics program. Athletic Director Missy Townsend began investigating her options and we wanted to share the four main reasons she brought ScoreVision to her school. “It’s really been a great experience for us to show what real-world work experience looks like using these jumbotrons,” said Robyn Bryce, Media Production instructor at Prescott High School. One of the greatest advantages of a ScoreVision jumbotron scoreboard is that the LED display offers students the opportunity to design and showcase graphics, videos, and more in front of fans and the community. Students gain real-world career skills in industry-standard graphic design software like Adobe Creative Cloud. Plus, students from other areas of interest can learn valuable career skills, which you can read about here. Like every other school in the ScoreVision Family, Prescott High School loves how much more engaged fans are at all of their home athletic events. “[The students] really like the ability to personalize their games with their walk-out videos and other content,” said Townsend. “It’s really added to the engagement of the events.” Student-athletes feel an incredible sense of pride when they see themselves on the jumbotron in a player accolade, walk-out video, or leaderboard (and their parents love it too!). Prescott High School needed their new scoreboards to serve a variety of purposes, and only one of those purposes was keeping score. 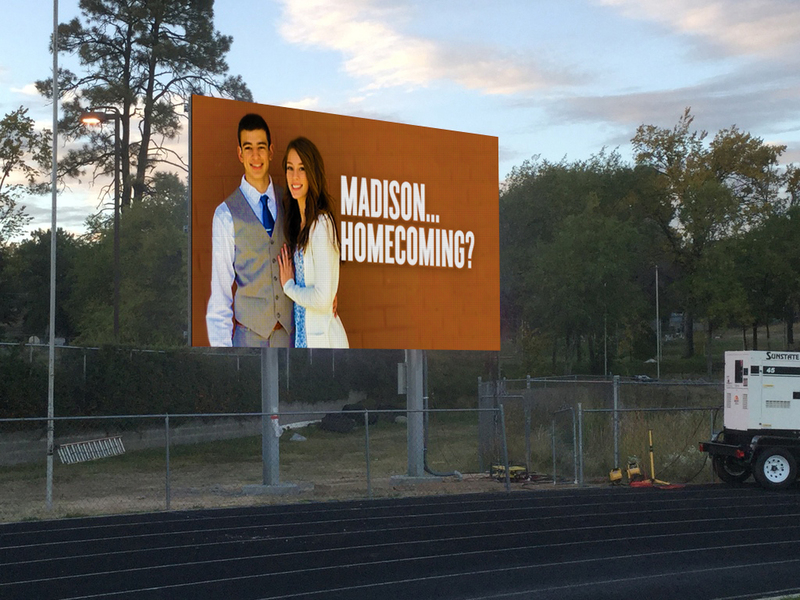 Students and faculty continue to find new uses for their ScoreVision jumbotrons, both in their gym and out on their football field. Some of those uses include graduation, pep assemblies, senior nights, award ceremonies, career fairs, practice drills and film review, JROTC national inspections, back-to-school convocation, and even a homecoming “proposal”! The administration at Prescott High loves the fact that using the jumbotrons for these purposes really adds to the engagement of students at the events. Watch our video below to hear more about why Prescott High School upgraded to ScoreVision! Interested in learning more? Check out last week’s blog post on the evolution of in-game production and stay tuned for next week’s testimonial from Blue Springs High School!